Canadians, on average, make up about 3% of the audience at NASCAR races at the Pocono Raceway. A small percentage you might say. Perhaps. But when the Canadians are there, you know it. Big time. And the personalities on these guys I'm about to tell you...they more than make up for 3%. They had us all cracking up the moment we met them. 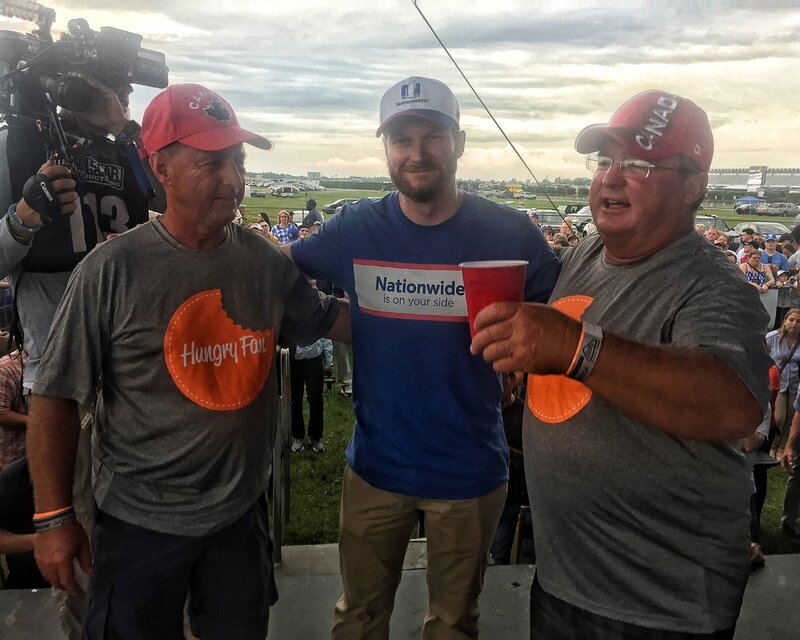 In our first blog about our experience at the Pocono Raceway Fan Fest on July 28th, I told you all about the first ever Hungry Fan Throwdown at the NASCAR Fan Fest at Pocono. We featured two teams of two, who we selected from Pocono's Infield campgrounds, and who were coached by the likes of NASCAR elite, Dale Earnhardt Jr., Ryan Blaney (who won the Pennsylvania 400 at Pocono a couple months before), Martin Truex Jr. (who won the following week at Watkins Glen), and Landon Cassill. When we (me, the Hungry Fan Team, and a super cool Pocono Raceway representative) went out into the infield to find our teams, we first found Michelle Duchnik, who we profiled in our first blog. She and her husband told us their incredible and tragic story; and lucky for us, she agreed to participate. One team down, one more to go. Our Throwdown was halfway staffed! We set off again, looking for some more diehards who we thought could bring Michelle some good competition. As we navigated the soggy pathways through the campground, we noticed a bunch of very prominently placed Canadian flags. Aha! I have always had great experiences with Canadian sports fans--whether it be at basketball events, hockey games, and especially at the Olympics. Canadians are great. So nice--as they're pretty much internationally regarded I think--and super pleasant. So you can imagine my excitement upon seeing these flags. We had to investigate! Behind a couple RVs we found a gaggle (silly Canadian geese pun/probably not my best) of Canadian fans, enjoying Molson (of course) and margaritas. They looked upon us inquisitively but immediately, in true Canadian style, offered us drinks. In the crowd...Bill and Ron McBeath (pictured below). I asked Ron what he, Bill and their crew were thinking. Ron replied, "When you folks came to the camp site that day a number of things ran through our minds and I recall asking if we were in trouble (haha) for some reason but when it was described what the event was about we were in awe that a pair of small town Canadians from Madoc, Ontario had the opportunity to participate in an event like this was truly a privilege." Ron continued, "After we committed to the event, reality set in and did I get nervous in a big way. That hour was possibly the most nerve racking time of my life. More nerve racking than getting married 29.5 years ago--I had 6 years to prepare for that event and 1 hour for this [one]." When the brothers McBeath arrived to the stage area an hour later, they were clad in their Hungry Fan t-shirts, Canada hats and they were both (if I recall correctly) still sporting ice cold Molson hand candy. They were lively and funny as heck, vivacious and seemingly ready to attack the challenge. Ron admits they were a couple shots of liquid courage in (understandable) to help calm the nerves. And adds, "We weren't just sure what to expect or what the outcome would be, but we were committed to doing our best." Their secret weapons, perhaps? Their wives Tammi and Anne Marie--and the entire Canadian crew--giving them quick hints and running through a variety of scenarios as they walked on stage. To be fair, just as Michelle Duchnik had some serious culinary chops, so too did the brothers McBeath. Ron and Bill are old hats at cooking at hunting and fishing camps. Though the pressure there is a little less intense. The "judges" are usually several drinks in. Our event was a whole 'nother can of worms. What I didn't know was that before the event, Team Michelle and Team McBeath (we called them Team Canada) made a pact. Ron explains, "Bill & I made a pact with the ladies that if we decided who we were cooking with, that they would pick Dale because we wanted them to pick first. Ladies first our mother taught us." He adds, "When we got on stage and realized that there would be 2 drivers for each team and when we found out who the drivers were, we knew that even if we didn't win the challenge, this was going to be a once in a lifetime event anyway." Ultimately, we let the drivers select their teams. Dale Jr. and Ryan Blaney selected the Canadians and Martin Truex and Landon Cassill selected Team Michelle. Ron notes, "My wife Tammi is a huge Dale Jr. fan and when the possibility of cooking with him was there, she could hardly breathe. When Dale and Ryan picked us to be on their team, our wives said their hearts skipped a beat and I think mine just about stopped." (As an aside, Ron shares that after the event, both he and Ron were struck by "what great guys and how down to Earth, normal men Ryan and Dale Jr. were). Coaches onboard, secret ingredients in hand, Team Canada had 25 minutes (we actually ended up giving them an extra 5) to create a winning plate that would please the judges, myself included. No pressure, right? Ron said to me, "It was hard to grasp that we were actually on stage in front of a big crowd of people with cameras all around trying to create a plate of food with 2 famous NASCAR drivers to try to do Canada proud and win the challenge." I asked Ron what he perceived to be his biggest challenge in the time that lay ahead of him. I enjoyed his reply. "My biggest challenge when preparing the food was not to cut my fingers off because I was so nervous." After the race he added, "I quickly counted [my fingers] when it was over and confirmed to myself that they were all there." Two very funny, noteworthy things happened in the span of time allotted for cooking...and one sliiiiightly after time was up. Perhaps my favorite...was Dale Jr. trying to show Ron and Bill how to cut an avocado. Prior to the event, my Hungry Fan Team and I hit up the nearby Weis Supermarket, loading up on all the ingredients for that day (both the secret ingredients and an entire pantry/cooler full of other food items for our teams' dishes). I spotted some ginormous Florida avocados (that happened to be on special, woohoo!) and I snagged 'em. Cut to that evening on stage: the Canadians are eying them but it's clear they have little clue what the avocados were. Hiiiiiiilarious. They're cutting at one, clearly unaware that it has a pit. I watched as Dale Jr. immediately jumped in to explain how to cut it and what it was. Score 1 for Coach Dale! My second favorite thing that happened: I get a tap on my arm while I am whizzing around, trying to make sure both teams have everything they need. It's Dale and a brother McBeath asking how to make salad dressing. (P.S. What a privilege it is to get to teach that to both a super fan and a NASCAR legend). Team Canada and Coach Dale Jr. learn how to make salad dressing from yours truly. Ron calls the salad dressing an old Earnhardt Family Recipe. Maybe it is now?! Ron continued to ask me how much time remained throughout the competition. Clearly, 30 minutes flew by. I called time and everyone's plates were done and ready for judging. Or so we thought. I first went over to Team Michelle to ask about their approach to the competition and to find out what they had made and how they had incorporated the secret ingredients. It looked delicious and they had managed to use everything required. A job well done if you ask me! I then made my way over to Team Canada. I asked the same questions. When I got the question about the use of the secret ingredients, which included bacon, beer, zucchini and strawberry jam, a very spirited Ron screams out, "Strawberry jam!? On this?! No way! That stuff's for breakfast!!" Whoopsies. The Canadians left out a secret ingredient. What to do? No time to answer that question because behind me is Coach Dale, swiftly and covertly dolloping strawberry jam on each piece of pork the guys had made. "Overtime!" he shouted. (Score 2 for Coach Dale)! I've got to give Dale Jr. props for that. While stretching the rules a bit, the jam saved the day. We judges spent some time tasting and judging the dishes. It was seriously tough. Both dishes were truly fantastic. I'll never forget Michelle's strawberry jam coated, barbecue zucchini sticks. So good. (I actually caught Coach Blaney of Team Canada snagging one during the competition. Seems he knows good food when he sees it too). And the Canadians...after learning about avocados, they ended up grilling theirs. That was delicious. While the judges talked things over, Ron notes, "I had an opportunity to talk to one of my favorite drivers, Martin Truex Jr., and what a gentleman he is. I told Martin as well as Dale and Ryan not to sample what we had cooked because they might not make the race on Sunday if they did. No guarantees." Ha. Ye of little faith. In a close, close decision (that in retrospect could have easily just been called a draw), the W was given to the brothers McBeath and coaches Dale Jr. and Ryan Blaney. It's so rewarding for me to hear from guys like Ron and Bill McBeath that they not only enjoyed the Hungry Fan Throwdown at the Pocono Fan Fest, but that to them it was a "once in a lifetime opportunity." I can only hope Pocono Raceway, NASCAR and the fantastic teams and drivers involved feel as blessed as I do to help make that happen for such quality people. So what's on tap for Ron and Tammi McBeath? They typically attend Pocono annually and this past year they also had the chance to visit the Las Vegas Speedway for the March race. Ron says that Tammi hopes to go to Daytona this coming February for their 30th wedding anniversary. I hope they make it! As Ron quotes, "Happy Wife, Happy Life." Needless to say, he is working on making that happen. Ron hopes that with retirement coming soon, that he and Tammi will have more time and flexibility to attend additional races and cheer on their favorite drivers (Dale Jr. [who is unfortunately retiring at the end of this year], Martin Truex Jr. and Kyle Larson).